Two new floor plans have been released at Lake Las Vegas real estate, Plan Five and Plan 6. These plans have been reduced considerably over the past month. Bella Fiore Plan Five offers three bedrooms, 2.5 bathrooms, island kitchen, great room, dining room, three bay garage and options to include an extra bedroom and bath. The plan is now priced starting at $479,950. Plan 6 includes three bedrooms, 2.5 bathrooms, courtyard, den, family room, three car garage and options for an additional guest suite or a hobby room. It is priced from $499,950 for 2,593 square feet. For additional space, Bella Fiore has additional home floor plans from 2,822 to approximately 4,376 square feet and are priced from $534,950. The community boasts Tuscan and Mediterranean design architecture along with amenities such as an optional casita, an interior courtyard and a home office. 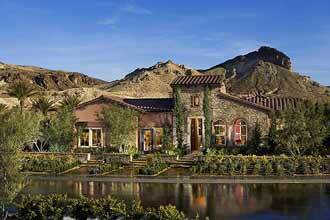 Luxury homes in Lake Las Vegas discount home price by up to $75,000.